Jane Green is getting ready to launch her new novel, Summer Secrets, on June 23rd. To celebrate she has offered me an amazing beach tote brimming over with awesome goodies and a signed book to give away to one lucky reader. Here’s a look at what’s inside the tote . 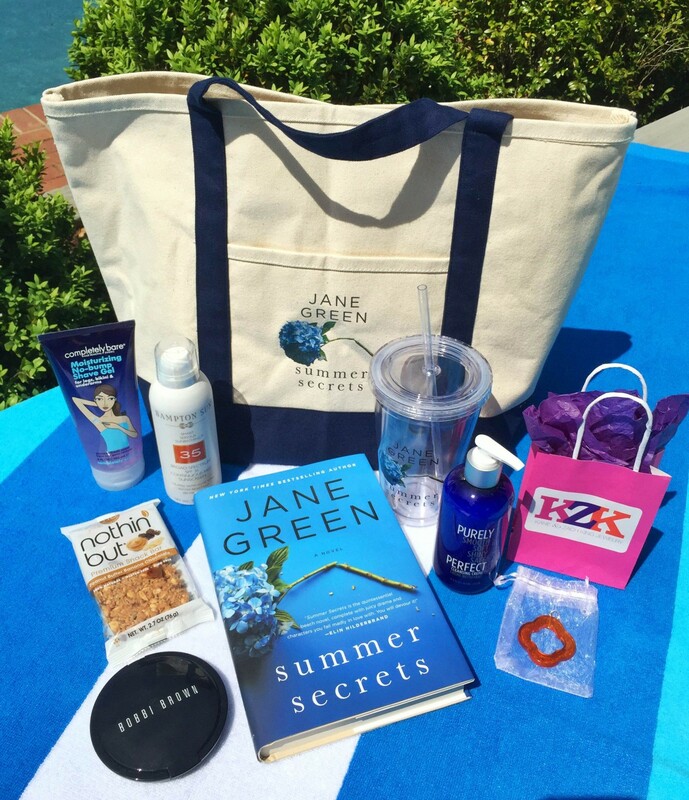 . .
An exclusive cold carry cup with the Jane Green Summer Secrets logo! A tube of moisturizing no-bump shave gel from Completely Bare Products. I have one of these fantastic bags to offer . . . Wow!! This is quite a haul. For a chance to win, fill out the form below on or before midnight, Tuesday, June 30th, US only, no PO Boxes. I will choose one random winner and they will be notified by email. For a bonus entry leave a comment telling me … What’s the best thing about summer for you? The best thing about summer for me is taking mini road trips and going to the ocean. I love the ocean. The best about summer is having more time with my kids, taking them swimming, and getting to read more. The best thing about summer is sitting out by the pool every day reading a book. I am a bit more relaxed and my husband and I spend time together walking and then getting together with friends. I like summer because I like to sit on my back porch and read and watch the butterflies on my butterfly bushes. What a great giveaway! The best thing about summer for me is the slightly lazier pace that comes with school being out. Plus some time at the pool is pretty great! The best thing about summer for me is the warm weather, and spending more time with my family. Not to mention that I get a chance to read more books. I love the weather, reading outside, traveling to new places, the beach, and of course, watermelon! Thanks for hosting. Summer means fresh produce from the garden, days spent on the beach and nights camping with friends! The best thing about summer for me is swimming in an outdoor pool. I love to practice my backstroke and look up at the clouds, the trees, the birds, the plumes from planes — it’s so relaxing, which is what summer’s all about. Summer is my favorite time of year because I enjoy the heat, sunshine, long walks in the foothills, reading in the backyard and hopefully a vacation to the beach. The best thing about summer is getting to lay outside soaking up sunshine with a great book in my hands 🙂 My summer reading list is VERY long this summer and I plan to read all of them! The best thing for me is simply enjoying the warmth of the sun. Thanks for the giveaway contest. The best thing about summer for me – is longer daylight hours. the best thing about summer is spending time with the kiddos. The best thing about summer is road trips!! The best thing is the slower pace to enjoy reading a great summer book around the pool. Thanks for hosting this great giveaway. Summer means no school schedules for the little ones!